Here is the OOC for this. Forcefield - Intact, Breaking, ? Pinions - Kinda intact, ? Pillars - Mostly Intact, ? Considering this would be a combat thread its success is determined most of all by pace. If we are to see this thread until completion there are a few things I'd like to try which would keep the pace. All these points apply to combat. 1. There shall be a time limit of around a week after a GM post for all IC PC posts to be written before I write the next GM post. Same time limit for non-combat posts if nothing is happening but we're waiting on PC turns. 2. If you aren't feeling up to an IC post, just tell me what you are doing in Discord or OOC, then either I or you could roll for your action. I would need a.) the different actions for your turn and b.) the general intent/tactics of the PC for your turn. 3. I shall remind the next person to post in either Discord, if I see you active, or in the OOC thread, if not, a day or two after the last IC PC post. 4. I reserve the right to control your PC for the round if you do not post within the time limit or do #2. I shall try to adhere to the Powers and Tactics portion of the PC's character sheet. 5. If the there is no IC post for the PC, I'll just write down their actions in the GM post, Rule of Cool and all. You can tell me if you want it described some specific way. Quick question on the IC - for clarity of descriptors/etc, were they all transferred physically and whole into the suit's world, or just their minds/souls (and a projection of their belongings)? It'd be the latter. Your minds/souls and belongings were transferred inside the armour. But hey, you still have physical stimuli! Give me a Craft (Art) or Knowledge (Arcane Lore) roll to see what Veronica could parse. You could also roll Knowledge (Technology) or Craft (Structural). The skill will determine what you get. A pretty bad roll, she only gets a 15 on Kn: Arcana. The area, looked at through your senses, isn't as empty as it would seem at first glance. The whiteness hides within it bands of magic, shifting and seething in grid-like patterns. The "ground" you stand on. The "sky" above you. Like two chips placed on over the other with you in the middle, they and magic stretch from horizon to horizon. Arthur Whitfield too is saturated in this glowing grid magic, though more lay hidden which you cannot parse at the moment. The best analogy you could give would be as if you were inside the links you manipulate between your trinkets. This is a binding. A glue that holds many, many things together. Okay! So here's what Ouroboros gets with that Rep roll. And I do need to create a map for the Self but needless to say, it's bigger than it looks. It's a mishmash of old, traditional magic molded into something else. You recognize different signatures beseeching entities and concepts hidden beneath the newness of it all, as if someone (ie. Nicole) had taken arcane books and scrambled all the words to build on the original. What you think is happening is that there is a spell-virus brute forcing its way through, breaking the words into a meaningless jumble. Regardless, and more importantly, you see the Self. Consisting of multiple, overlapping dimensions to fit different important functions, the Self could be divided into several main areas some of which are broken by the initial assault. 1. CPU. The center of everything here. Where you should let the helmet merge. Still intact. 2. Inner Forcefield. Last line of defense for the CPU. Keeps outside things out and is powered by multiple generators. Currently breaking. 3. Pinions. Something that keeps the CPU stable, otherwise the CPU would overload and slowly wreck havoc throughout the armour. Mostly intact. 4. 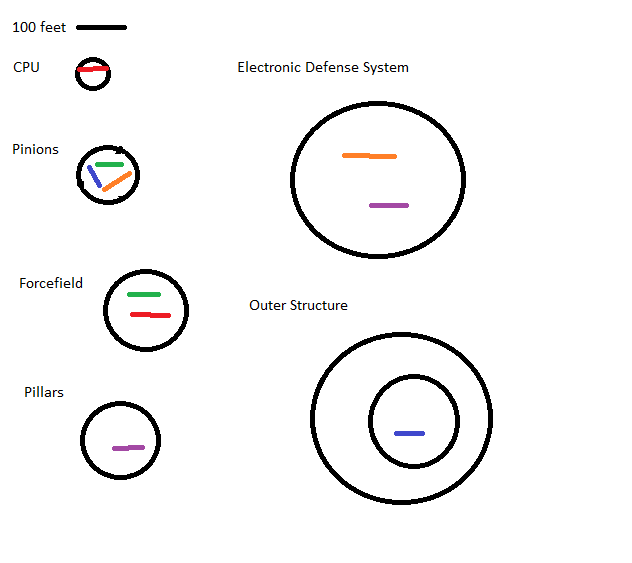 Electronic Defense Systems. Where the defense of the CPU could be directed. Offline. 5. Pillars. Holds up the various dimensions housed in the sphere. Without it other dimensions would be harmed. Mostly intact. 6. Outer Structure. The layer that separates the insides of the sphere from the outside. Already breached. Additionally, you sense the trail of whatever had broken in to continue deeper into the sphere but it is out of your vision, just too far and obstructed from view right now. The matching colored lines reflect doorways into the other layers of the sphere. Outer Structure - Breached, ? PS: There are some game features in there but for the brevity's sake, I'd write them down as you encounter them in person. This is also me taking inspiration from Thev's map in another thread. Thanks Thev. Hi guys, so hope you had a good holiday but in the spirit of trying to get this swinging again I'll be giving you a few things you could do. 1. Fix the pinions. You've got one pinion completely broke and another also broke but running on someone else's magic. This was Ouroboros' suggestion. 2. Explore where the doorway leads. You've got one doorway which you hadn't gone through yet and the sound of pistons hammering through it. Ouroboros' senses and educated guess would point this as the Inner Forcefield room. 3. Create some distractions as per Masque's idea. I don't know what kind of distractions you'd be doing or how, so tell me in here. 4. Read the engravings. Well, if you want some more fluff and want to stretch those ancient arcane reading skills. Though you need to know how to read multiple magical languages first. Maybe Comprehend Languages could help? 5. Study what the gears in the ceiling are for. What are their purposes and how could you use them? 6. Talk. Well, talking is mostly a free action for me unless it's cooler and/or funnier to interrupt the players. Or if I just want to fast track things. But in a format like this, character interaction is always a great idea. 7. Just go through to the Inner Forcefield place. You can do all these or think of other things to do or do a combination of them. You're four characters so, yeah. But remember, the clock is still ticking (excepr for #6). Also, you still up for this thread @Nick? Oh, and I have to ask, anyone want to explore anything character-wise here, even if it's just like Masque being out of her depth for example? For the sake of coordination, Masque can throw up a nice illusion to buy time if anything toothy shows up; she could also send a copy of herself off to draw personal attention, but she'd really rather not. No specific character exploration for me, though! Masque is just making friends and having adventures today, and the weird bit with her mask having its own Self was just opportunism on my part. Well, given Masque's role in any party is misdirection, this would be a good start when things kick off. It might mean you won't get surprised, or if you do then you'd get another round as whatever comes takes the bait. Still, Fox's plan is something to do when things start to kick off. You guys still remain undetected inside that room so no one's coming for you. Want to do anything there or will I skip to Inner Forcefield room? Roll me Veronica's Super Senses rank, @Thevshi. With that high a rank yoi'd auto-succeed but let's see how much you get. Also anyone, including Thevshi, can attempt to fix a pinion. Tell me which one you want to fix. You can roll either Craft: Art or Craft: Structural to attempt to fix one of the pinions without creating and using a repair-specific power. Knowledge: Arcane Lore is also a possibility but at a higher DC. Or you can create a repair power if you're capable of it. Get a bonus for Ritualist or Artificer. Okay, making a super senses check she gets a 26. Take a +5 on the next roll to fix a pinion as Veronica directs the fixer on what to do. Like an archaeologist looking over a blueprint for an ancient structure, Veronica can see how all the parts fit. She can direct how to recreate it, brick by brick. It's obvious that these pinions are beyond repair save for, you know, magicing them into repair. Another way of repairing the doorways is to replace them with the various part and gears hanging from the cieling. There's a mechanical system, like some clockwork out of a steampunk movie, that would bring down the parts needed. Veronica could tell which those are and it's only a matter of fitting them properly. Looks easy enough... right? Depends on the application roll. Maintaining his super senses at the same time: ( (Mage Sight; on Magic Awareness [Visual]: Analytical 1, Counters Concealment 2, Counters Illusion 2, Tracking 3 [All Out Move]) [10PP] ) to help guid it and Arcane Lore check not to screw it up is a 22 before bonuses from ritualist or Veronicas guidance, or whatever benefits the heal effect might grant. Idea being he's summoning void stuff to patch up the damaged pinion. It'll hold for an hour so should be enough to keep it secure while we deal with the bigger problem and then Salvo can do a real fix without Huang leaving his magic in her suit. There are actually two pinions. One's broken but being held up by something's magic and it powers a doorway to the Inner Forcefield and the other is broken and going to the Electronic Defense System. Which one are you trying to fix or you trying for both? Some stuff will come up depending on what it is you try. In either case you do manage to fix what you set out to with both your Mage sight and Veronica's as a second opinion. Creating an artifact is kind of like a ritual of sorts, you've got to get the right measurements and the right ingredients and bring them all together in the right way and right situation to fit. Don't forget the incantations. Luckily, your Heal power gives you the ability to create the ingredients and the mage sight, what measurements. Except this ritual is one of stone and steel, of gears and micro-fractions. Luckily the void energies work as a stopgap measure and it holds, a mixture of bronze and nothingness, before ever slowly starting to pick up in speed. Yeah, alright; not Masque's area but in the interests of contributing to keep things moving, Masque's going to take a good look at the spell-supported gear. She's probably more interested in the spell itself than the gear, which other folks have a far better handle on. Does it have a purpose beyond fixing the pinion in place? Why bother? Can it be (safely) cancelled out so that the pinion can be fixed or replaced without screwing something up? It isn't part of the suit. First thing you notice as you poke through it. It feels different. Foreign. Artifacts have signatures and every dimension, though different seemed to be suffused with a common element. Not this spell. And you sense a presence there, like a set of eyes watching, but you are able to skirt around it. It seems to be intelligent, maybe? Or perhaps it is automated. From what you can tell without alerting the pair of eyes it leads towards the Inner Forcefield dimension. There could be more information but you doubt you could find it without anouncing your presence to whatever's inside. As to fixing it without breaking anything, well, Ouroboros fix of the other doorway seems to have done well enough. What's the worst that could happen? I'll give this a few days to stew in case anyone wants to interact or take some proactive action. Otherwise, I'd kick it into gear then. Also, @Fox , roll me Knowledge (Arcane Lore). @angrydurf , roll me a magical sense power. ZB, you should claim credit for that last IC post. Both it and the post before are sufficiently long to warrant credit for post counts individually.